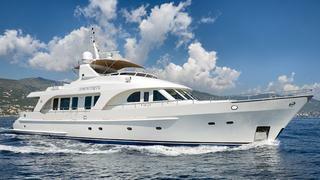 The 25.6 metre motor yacht Amphitrite, listed for sale by Jeroen Van der Vliet at Van der Vliet Quality Yachts, has been sold with the buyer introduced by Geoff Lovett from Geoff Lovett International. Named after a Greek sea goddess, Amphitrite was built by Dutch yard Moonen in steel and aluminium to a design by Rene van der Velden and delivered in 2008 as the eighth in the yard's popular Moonen 84 series. She accommodates eight guests in a master suite and three further staterooms, all with en suite facilities plus two crew cabins. Her interior styling by Art-Line Interior Design includes a free-standing sofa in the saloon and there is cherry wood wall paneling throughout. Amphitrite offers a flexible layout as the galley can be entirely separated from the saloon in order to create more privacy for the guests. Moonen has won a well-deserved reputation for building successful 'pocket superyachts' and this one is no exception. Equipped with twin Caterpillar diesel engines, she has a top speed of 12.5 knots and a range of 2,800 nautical miles at nine knots.